It arrives in England about three months after its launch, allowing second-graders in Maine to collaborate with a British school in studying world exploration and how communities evolve. The miniature sailboat Red Storm was deployed off the training ship State of Maine by chief mate Brendan McAvoy. 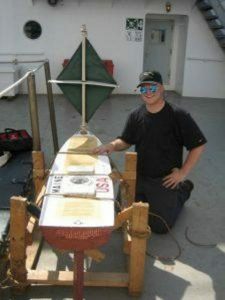 The School Department’s 5-foot sailboat, called Red Storm, was deployed in May from Maine Maritime Academy’s training ship, the State of Maine, on its voyage to Spain. Cassie Stymiest, program director at Educational Passages, said Maine Maritime Academy deploys mini-boats in the Gulf Stream annually for the organization. During Red Storm’s first voyage, in 2015, it was deployed off Georges Bank by lobstermen on the Gladys Elaine. In late July of that year, the craft landed on the island of Arranmore on the northwest corner of Ireland. 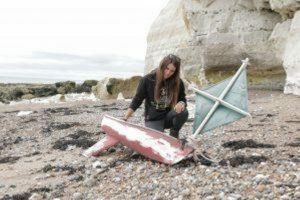 The 5-foot mini-sailboat Red Storm made landfall in Sussex, England, in August. The latest voyage will allow second-grade students to collaborate with another school in England to kick off a unit centered on world exploration and how communities evolve. Stymiest said that for students, tracking the voyage via GPS creates a tangible learning experience, and prompts them to think of geography and how it relates to where they are. It teaches oceanography, and about wind and water currents.